Now we see where Callmedave Cameron is getting his ideas from! Yes, it is! (or was). 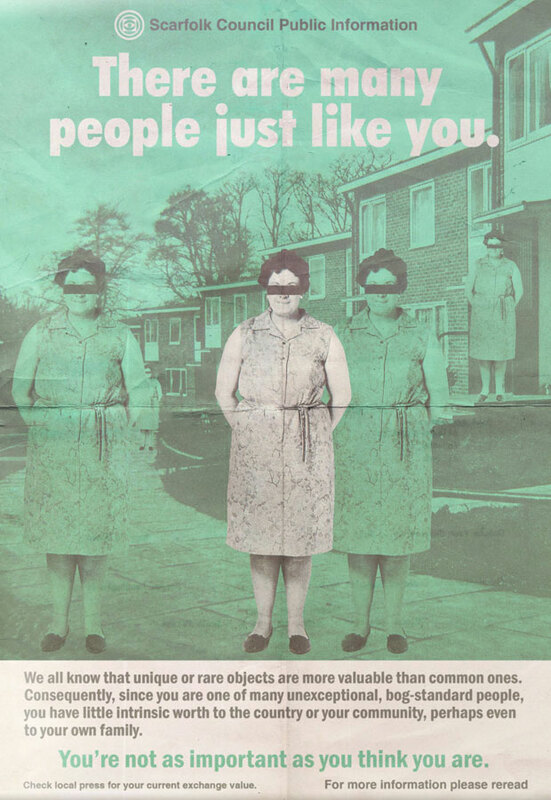 It was one of a number of strategies developed by Council as part of a far-reaching policy of Scarfolk population growth partly based on the theories of Thomas Malthus, whose great great grandson lived in Scarfolk (he managed a mask factory) and was an Alderman. Prostitution, drug dealing, unchecked crime, abstinence and sterilization (Council pioneered the idea of gifting a transistor for vasectomies, later very successfully exported to India) were effective in controlling numbers but expensive to implement and time-consuming to upkeep. The Citizen Value program was outstanding for its thrifty results – suicide, self-harm, depression and hopelessness all sky-rocketed in Scarfolk because of it and kept populations numbers well in check. It was a ground-breaking policy later modified and used effectively by both the South Korean and Japanese governments on their populations. Thanks for shining a light on this, Dr Littler!